Published Oct 5, 2015 by Pearson IT Certification. Part of the LiveLessons series. 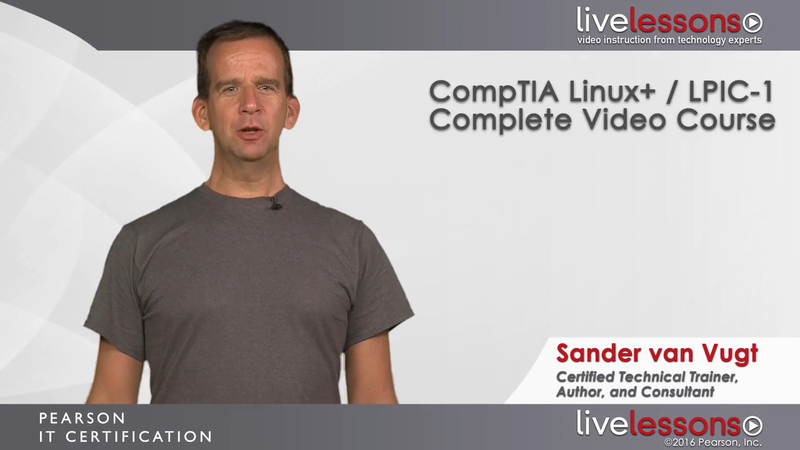 CompTIA Linux+/LPIC-1 Complete Video Course provides a solid understanding of all topics that candidates need to master to pass the CompTIA Linux+/LPIC-1 Certification. The training includes interactive practice quizzes and hands-on exercises, so you can practice what you learn and assess your skills. CompTIA Linux+/LPIC-1 Complete Video Course offers almost 13 hours of training covering all objectives on the CompTIA Linux+ and Linux Professional Institute LPIC-1 exams. With 140 interactive practice questions so you can assess your skills, hands-on exercises to help you cement knowledge, and CLI task simulations, the CompTIA Linux+/LPIC-1 Complete Video Course offers you everything you need to study for and pass the exams. 28 lessons in 7 modules divided into separate exam sections make sure you learn every topic included in the exam objectives.